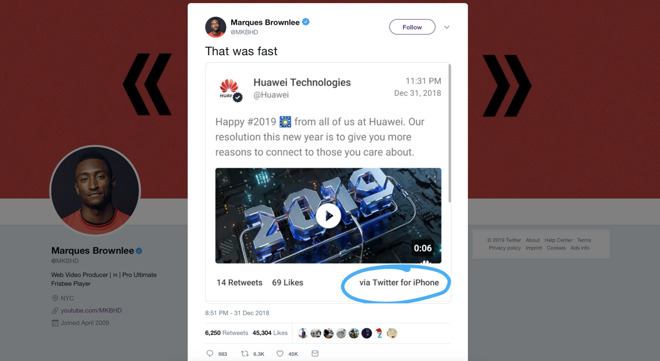 Just days after Nikkei Asian Review contrived the story that 20 Chinese firms were supposedly supporting Huawei in a boycott of Apple's iPhones, Huawei itself tweeted out an official New Years' greeting—from an iPhone. Despite an international incident involving the arrest of Huawei's CFO Meng Wanzhou on fraud charges related to violating U.S. trade sanctions against Iran, and the supposed Asian iPhone boycott announced by Nikkei, the Chinese phone maker's public relations group continued to use iPhones in the promotion of its brand, as noted by MKBHD video blogger Marques Brownlee. Screenshots of the Twitter incident were posted to China's popular Sina Weibo social network, where users posted colorful Chinese idioms that still skewer even when machine-translated into English: "Who requires Huawei employees to use Huawei mobile phones? Not to mention this is not the mobile phone department," and "Which mobile phone is good, the employee's stomach is the clearest!" The idea that a couple dozen companies in China were trying to promote the exclusive use of Huawei phones was big news among bloggers trying to perpetuate the idea that Apple was facing big problems in China—a place where iPhones are actually comfortably positioned as the largest and most entrenched platform among affluent users of premium phone models. Globally, Apple captured a 47 percent share of the premium segment above $400 in December quarter and was the "driving force" for premium expansion in a market that is otherwise shrinking, according to Counterpoint Research's Market Monitor. That's an increase over the previous quarter when Apple made up 43 percent of premium phones. In phones priced between $600 and $800, Apple makes up 61 percent of all sales, and above $800, it accounts for 79 percent of units sold. But while writing about the supposed voluntary boycott of iPhones in China, reports seemed to forget that Huawei itself is flat-out banned from use by the U.S. government and that the U.S. is actively working to prevent its allies from using phones or network equipment from the company. That's because, as a U.S. Senator stated last February, "Huawei is effectively an arm of the Chinese government and it's more than capable of stealing information from U.S. officials by hacking its devices," adding. "There are plenty of other companies that can meet our technology needs, and we shouldn't make it any easier for China to spy on us." Despite being the second largest maker of Android phones, Huawei has little penetration in the U.S., one of the largest markets for premium models. Like other Android makers, it largely relies on huge volumes of lower end phones to price-sensitive markets, resulting in marginal profits. That's making it hard for the company to keep up with Apple in silicon, despite the backing of the Chinese government. In parallel, the same Nikkei news agency has repeatedly worked to seed the idea that Apple's suppliers are reporting financial troubles and that nobody can afford its premium models. Back in 2016, the Nikkei claimed iPhone 6s production was expected to be cut by "around 30 percent" based on sources attributed only to "Japanese and South Korean parts suppliers." Last year, Nikki flat out announced that sales of iPhone X were "disappointing"—a claim that was entirely false. It also claimed Apple was slashing production orders for iPhone X in half, cutting 20 million units "from the figure of over 40 million units envisaged at the time of its release in November," numbers that were ridiculous on their face. Apple had previously sold 50-60 million iPhones in total in its January quarter and clearly didn't expect to sell 40 million $999 iPhone X models on top of the baseline of iPhone 7 and iPhone 8 models it was producing in parallel. Yet the media continued to carry this "report" as news from a reliable source, despite years of being repeatedly wrong. Nikkei supported its nonsense with continued claims of "slower than expected holiday sales" the U.S., China, and Europe. This year it repeated the same claims about Apple's new models, with the same "staff" byline and same anonymous sources claiming to be able to interpret Apple's supply chain. That once again helped fool Bloomberg and the Wall Street Journal, whose junior writers hired from blogs jumped on the bandwagon to insist that Apple's iPhone sales were in the tank because of their pricing and because the most advanced iPhones ever supposedly didn't involve any "innovation." Tripp Mickle of the Wall Street Journal claimed Apple "is slashing planned production" of iPhone X "in a sign of weaker-than-expected demand," while Mark Gurman, writing for Bloomberg, was so confident about "lackluster" iPhone sales that he actually stated, "Apple Inc. earnings this week will confirm what most investors have finally accepted: The iPhone X didn't live up to the hype." Stories about uncertainty in Apple's supply chain are nearly as common as paid Android endorsements from celebrities who are still using iPhones. Companies licensing Android have a long history of eroding their own brand value by preferring to use iPhones to deliver their marketing messages. 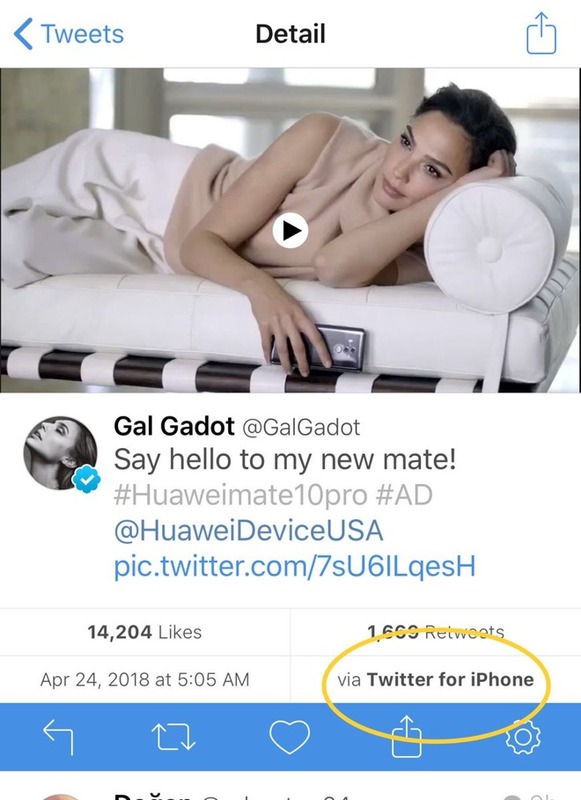 Less than a year ago, Huawei itself paid "Wonder Woman" actress Gal Gadot to serve as its brand ambassador for the high-end Mate 10 Pro, but the star posted her endorsement via her iPhone. The previous May, professional tennis player Sania Mirza tweeted out "Not rly a techie, but totally love using the OnePlus 3T the past few months. More in my story onepl.us/a5 #oneplusstarcommunity." It too was sent from an iPhone. In March 2013, after the Chinese government's CCTV propaganda channel began airing reports stating that Apple was "biased against Chinese consumers in its warranty and customer service policies," a series of orchestrated tweets on China's Sina Weibo from various celebrities and other well known personalities voiced unison disapproval of Apple on cue after the broadcast, many of which were sent from iPad and iPhones. At the height of Peak Galaxy, Samsung created a fantasy soccer league in 2013 intended to "combine fans' universal love for football and GALAXY devices," but then the legendary leader of its fantasy team Franz Beckenbauer tweeted his canned endorsement from his iPhone. Shortly afterward in April, Spanish tennis player David Ferrer tweeted his satisfaction with his #GalaxyS4 and that he was "configuring S Health on my new #GalaxyS4 to help with training @SamsungMobile," all via Twitter, que contento estoy con mi iPhone. Just prior to that, T-Mobile chief executive John Legere intended to use Twitter to direct attention to Samsung Mobile's latest Note 3 phablet, but inadvertently did so via his iPhone 5s. It hasn't just been Android getting fake praise from iOS users. In 2012, Oprah Winfrey used an iPad to send out tweets endorsing Microsoft's Surface, using the hashtag "#FavoriteThings" to say she had bought a dozen of them for Christmas gifts. In 2011, after BlackBerry paid Alicia Keys to serve as its Creative Director, she sent a personal tweet from her iPhone in February, then removed it and claimed her account had been "hacked."